Cleans tough brake dust and road grime. Gentle acid-free formula safe for all wheel types. Cleans chrome, painted, polished and powder-coated wheels. Removes dirt and debris from tires. Non-slip finish on wheels and tires. Wheels and brake parts always need extra cleaning power: brake dust, road grime, and intense buildup are harder to remove than regular dirt and dust. Wheel filth is also highly corrosive, and metal particles in brake dust damages wheels over time. 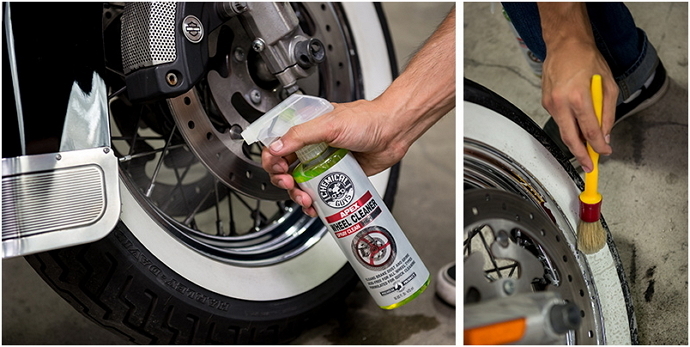 Apex Wheel & Tire Cleaner cuts through stuck brake dust to gently clean motorcycle wheels, brake parts, and suspension components. The pH-balanced formula contains no strong acids or bases, and is safe for all types of wheel finishes. Clean painted, chrome, polished, cast, forged, anodized, carbon fiber, and even laced motorcycle wheels with Apex Wheel Cleaner. Simply spray on, then wipe off with a microfiber towel to remove dirt, filth, and brake dust from any wheel surface. Apex Wheel Cleaner also cleans and restores a new look to tire sidewalls. Scrub the tire face with a microfiber towel or stiff bristle brush to remove embedded oil, road grime, and filth to reveal a new deep-black appearance. Apex Wheel Cleaner is slick enough to remove dirt and brake dust without scratching any glossy wheel finish, but finishes with a dry-to-the-touch feel so tires don’t slide out while leaning into the corners. Use Apex Wheel Cleaner to restore a fresh new look to any motorcycle wheel, including street bike, cruiser, dirt bike, and offroad supermoto. Carve into corners on fresh wheels with Chemical Guys Apex Wheel & Tire Cleaner. Brake dust is one of the worst substances for wheels. The nasty powder is made up of sintered iron from brake rotors, cooked carbon from brake pads, and burned-on dirt and road grime. Brake dust isn’t just difficult to clean, it is corrosive and will destroy wheels if left in place for too long. Apex Wheel & Tire Cleaner breaks the bond between the brake dust and the wheel surface so it can be easily wiped up and cleaned. The gentle cleansers lift and encapsulate dirt and grime so it can be wiped up without causing any swirls or scratches in sensitive wheel finishes. The pH-balanced formula contains no acids, no strong alkalines, and is safe for all types of motorcycle wheel finishes and tire rubber compounds. Clean any painted, polished metal, billet, cast, anodized, and carbon fiber motorcycle wheel with Chemical Guys Apex Wheel & Tire Cleaner. Tires are often overlooked during a detail, but cleaning and prepping them sets off the whole vehicle with extra pop. Apex Wheel & Tire Cleaner is safe to use on all types of motorcycle tires, including sport street tires, race slicks, touring tires, studded ice tires, and nubbly offroad tires. Whether the sidewalls get caked with burnt up rubber, intense road grime, or mud and pebbles from adventuring off road, scrub it all out with Apex Wheel & Tire Cleaner. Simply mist the sidewall with Apex, then wipe it off with an old microfiber towel. For intense stuck-in stains and debris, agitate with a stiff bristle brush taking care to not scratch any sensitive wheel finishes. Apex Wheel & Tire Cleaner removes dirt and grime and leaves motorcycle tires squeaky clean and ready for another round of canyon carving and street fighting. 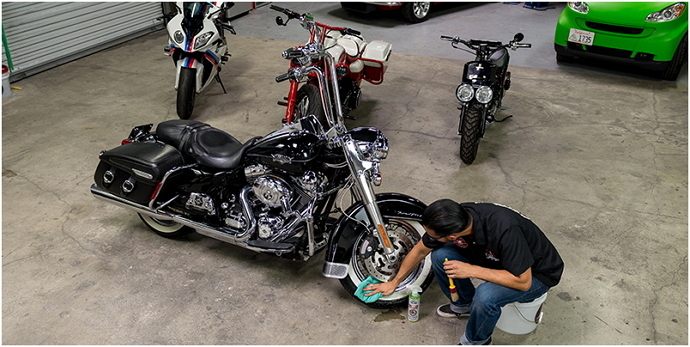 The Chemical Guys Motorcycle Line of detailing products is designed and blended for use on all types of cycles, trikes, and quads. 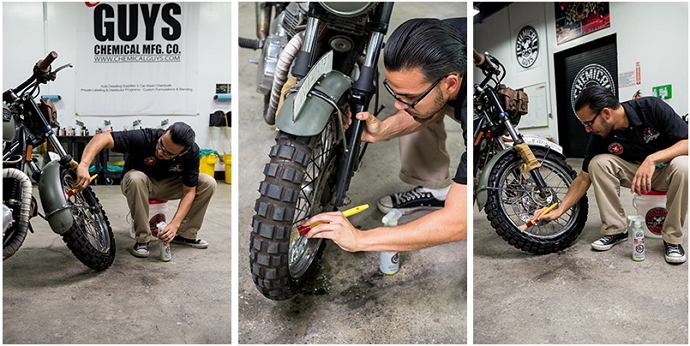 Clean, restore, and protect any street bike, racing motorcycle, competition bike, vintage cycle, custom chopper, touring bike, supermoto, motor trike, mini and pocket bikes, motor scooter, offroad dirt bike, quad bike, dual-sport/adventure motorcycle, ATV, and even bicycles with the full lineup of products from Chemical Guys. 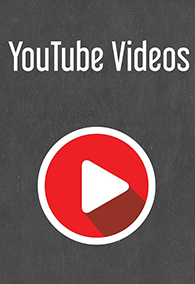 All cycles operate in similar conditions, and are built with similar materials across the board. The full Chemical Guys Motorcycle Line of products addresses every cleaning and detailing need for all these materials on these machines. 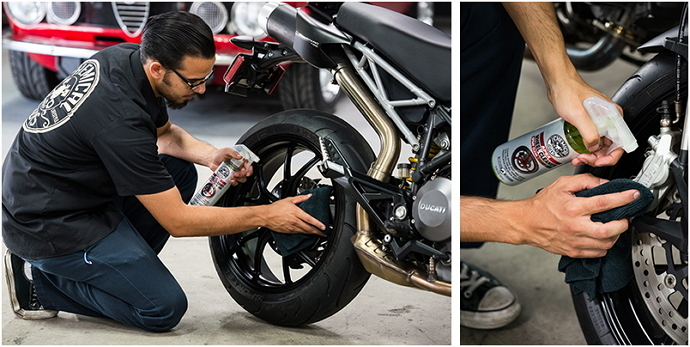 Clean, shine, and protect any cycle anywhere with the Chemical Guys Motorcycle Line. 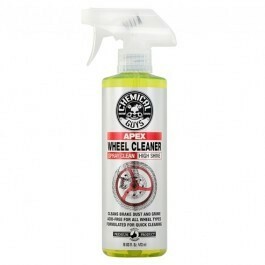 Apex Wheel Cleaner is also available in a 4 ounce size.